A pair of matching bracelets and not of the more familiar glass slippers is the key to reuniting heroine and hero in a tuneful operatic version of Cinderella, starting tonight at the Strand. The Boston Opera Cooperative (BOC) returns to Uphams Corner for a four-performance run of La Cenerentola, Gioachino Rossini’s opera, the plot of which is more complicated and humorous than the better-known Disney version of the famous Perrault fairy-tale. Rossini composed the score when he was just 25 years old in 1817, the year after he triumphed with his Barber of Seville. La Cenerentola, ossia La bontà in trionfo (Cinderella, or Goodness Triumphant) has a glorious overture that is often played, and the opera comes in at number 29 on the list of most often performed operas worldwide. Because Rossini didn’t have access to special stage effects which would make possible any “Bibbidi-Bobbidi-Boo” transformations, he and librettist opted for non-magical changes as well as a wicked stepfather instead of wicked stepmother and a philosopher/ friend instead of a fairy godmother. But they have the hero as well as the heroine running around in shabby clothes. BOC Artistic Director Andrew Altenbach makes his company conducting debut leading Grand Harmonie, a Boston/New York period ensemble that performs the works of Classical and Romantic composers on recreated, historically accurate instruments for they were written. As it website explains, “The core of the Harmonie ensemble is a pair of horns with a pair of bassoons underneath, and a pair of oboes or clarinets above; by the 1780s it was standard to use both oboes and clarinets. Noblemen in the decades on either side of the turn of the 19th century employed these ensembles for private music-making, or as a less expensive alternative to a full orchestra.” Grand Harmonie, however, adds strings and brass. 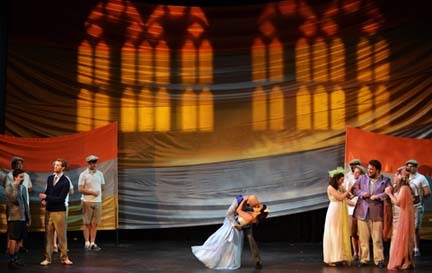 Stage director Katherine Carter opted for a modern “magical realism” motif with the cast in contemporary dress, channeling Prince William and Kate Middleton. Contraltos Stephanie Scarcella and Sadie Gregg will alternate in the title role, while tenors Zac Engle and Jason Connell will take turns as Prince Ramiro. BOC lives up to the Collaborative in its name by having vocal artists actively double as members of one of its production committees. For example, soprano Laura DellaFera who plays Clorinda is the Director of PR and Marketing. The opera will be sung in the original Italian with English supertitles on a small screen above the stage. Performances tonight through Saturday start at 7:30 pm. Before the Sunday 3:00pm matinee there will be an introductory lecture, and after the show there will be a meet-and-greet with cast free to ticketholders.